Южный Кавказ-2018: Мы ждем перемен? In the first days of the coming year Armenians speak much about "achievements". They are doing the same in the occupied territories of Azerbaijan too. The separatist regime also appropriates all possible sorts of "feats" and reports not only on unsuccessful attempts to support an unviable formation, but also on the destruction of the historical heritage of the real owners of these territories. It is about the Azerbaijani and Albanian cultural and historical heritage. Reporting on the "restoration," "excavation" and so on, the puppet regime of Khankandi actually signs a major crime against human values, the cultural heritage of nations. 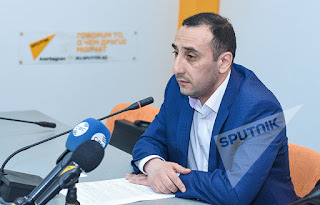 In this regard, some people in Armenia today remember the scandal that arose several years ago in connection with the "restoration" of the famous monument of Albanian architecture, ancient Gandzasar temple, located on the territory of the occupied Kalbajar region of Azerbaijan, by Levon Hayrapetyan who died recently in a Russian prison. Chief financier of the separatists Hayrapetyan started repairing and rebuilding the temple in a way profitable for the Armenians. But he did this without the permission of the separatist regime, apparently acting on the grounds that he, who pays, orders the music. So the scandal broke out only for this reason, and not because the historical monument, not related to Armenian history, lost its original appearance. And how did the Albanian Gandzasar look like before the interference of Armenian vandals? And how did the Armenian church subdued the temple? Interesting details on this subject can be found in the article by the director of the Center for the History of the Caucasus, senior researcher of the Institute of Law and Human Rights of the National Academy of Sciences of Azerbaijan Rizvan Huseynov, published recently in the IRS-Heritage magazine. 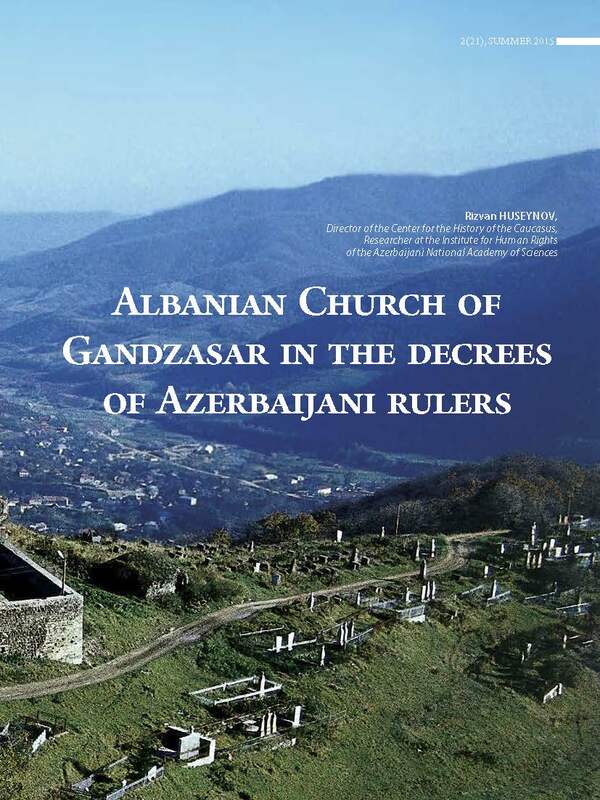 Huseynov writes that the 17th-18th centuries were marked by a fierce struggle for power and influence on the flocks between the Albanian Gandzasar Patriarchate and the Armenian Echmiadzin Catholicosat. At the same time, Echmiadzin used all methods to subdue the weakening Gandzasar throne to the Albanian church. Armenian clergymen, who first settled in Uchkilis (Echmiadzin) in the 15th century with the permission of the Azerbaijani rulers of Ak-Koyunlu, gradually grew stronger and pushed out the Albanian church in every possible way. The Albanian patriarchs of Gandzasar (located in the now occupied Kalbajar region of Azerbaijan and today completely Armenianized) fought for a long time with Echmiadzin, and when they were forced to submit for a while, it caused serious unrest among the Albanian population of Karabakh, who did not want to subdue to the Armenian church of Echmiadzin. As a result, a group of Albanian clergymen created a new Albanian residence near Gandzasar in the monastery of the Three Infants, where they chose their patriarch. The Monastery of the Three Infants fought against the Armenian Church of Echmiadzin and the Gandzasar Patriarchate, which became dependent on Etchmiadzin. Concerning these events, in the preface to the translation of "Jambra", Armenian historian Harutyunyan notes: "The Gandzasar throne was in the hands of the Khachen feudal lords Khasan-Jalalyan from the 1240s to the late 17th century and led a policy, independent of Echmiadzin until the 1630s, before the transfer of Echmiadzin to the hands of patriarchs coming from the Sounian desert. Then the Gandzasar patriarchs recognized the primacy of Echmiadzin and expressed their readiness to obey it. This was also facilitated by unrest among the population, which intensified and took on the most acute character at the end of the 17th century, when a new, self-proclaimed patriarch appeared in Karabakh, near Gandzasar, declaring the monastery “Three Babies” as the throne center. The Armenian writer of the 19th century, Raffi (Hakob Melik-Hakobyan) wrote in his "Melikates of Khamsa" about Gandzasar: "It is known that the catholicosate of Aghvank existed for fifteen centuries, beginning from the times of Grigoris (the grandson of St. Grigor the Illuminator) until 1828. Various monasteries of the Aghvank country served as the residence of the Catholicos, and the recent one was the Gandzasar monastery in the Karabakh province of Khachen." "We should not forget that the Diocese of the Catholicosate of Aghvank was not only Karabakh, but also Gandzak, Shemakha, Nukha, Derbent and other provinces." Raffi wrote about the Karabakh Christians: "These people are accustomed to living independently of Etchmiadzin, to have their own special spiritual government, which has been under the Catholicos of Aghvank for centuries." "Shortly after the return of Sargis to Gandzasar, a new dispute arose between him and Echmiadzin ... The reason for this was the vanity of the Catholicos ... During his stay in Georgia he went to Echmiadzin, where he promised not to use the title and the seal of the Catholicos, but to be satisfied with the title and seal of the archbishop ... But immediately after returning to Karabakh, he again began to call himself the Catholicos of Aghvank and to enjoy the rights of Catholicos ... Echmiadzin demanded that he fulfill his promise, but did not only ignore this trio but declaring himself completely independent from Etchmiadzin, used the protection of Ibrahim Khan's successor, Mekhti-khan. That feud lasted for three years, until the supreme Echmiadzin administration with the help of the Russian authorities forced Sargis in 1815 to renounce the title of Catholicos and take the title of Metropolitan with the rights of the Archbishop, thus ending the history of the Catholicosate of Aghvank, dating back to the times of Grigoris - the grandson of the Illuminator. " From the above text it becomes clear that having secured the support of the Russian autocracy, the Armenian clerics were able to overthrow the Albanian Catholicos. That is, the Armenian pricht of Etchmiadzin, using the direct support of the Holy Synod of the Russian Orthodox Church (ROC), actually forced the Albanian Catholicos Sargis to renounce power in favor of the new Catholicos of Armenians. Also, with the help of the Russian authorities, in 1815 Echmiadzin forced Sargis to renounce the title of Catholicos and accept the title of Metropolitan with the rights of the Archbishop. 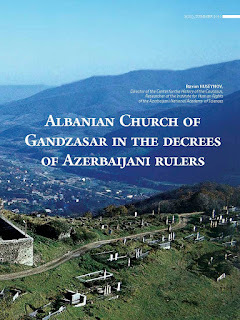 This is how the Armenians abolished the Gandzasar Catholicosat in favor of Echmiadzin and all the same became the "ancient" residents of Karabakh. Despite the requests of the Albanian patriarch, the autocracy carried out re-subordination of the Albanian churches to Echmiadzin, because both of them professed the Armenian Gregorianism. The Russian authorities ignored the fact that the parishioners of the Armenian Albanian churches were completely different peoples. This led to a riot, headed by Albanian Patriarch Israel. As a result, the autocracy suppressed the rebellion, the Albanian churches and flocks were subordinated to the Etchmiadzin Catholicos, and the Albanian patriarch Israel was exiled. Soon he died, after which the church of Etchmiadzin begged the autocracy to give it the church and the flock in Karabakh and Ganja. Thus, the Armenian-Khai ethnic group claimed the ancient and rich heritage of the various Christian peoples of the Caucasus, which the people called "Armenians" for their Gregorian faith. The request of Etchmiadzin was met and with the hands of the autocracy, the Armenian Church completely appropriated and destroyed the heritage, temples, culture and peoples of the Caucasian Albania, Rizvan Huseynov writes. It should be noted that the Gandzasar Monastery is one of many thousands of objects of cultural, spiritual and historical heritage of various peoples who inhabited the territories occupied by Armenia at the time when nobody even heard about Armenians. The choice of the "right lords" in due time allowed the Armenians to take root in these lands, after which the history of the peoples of this region turned into a tragedy. Today Kalbajar region does not account for a single representative of the indigenous population, and the separatists calmly report on "achievements" and count the number of "saved" and "discovered" alien monuments. Vandalism and falsification is another crime of the Armenian occupiers, for which they will inevitably have to respond soon.